HomeGold IRA BlogNewsWhy are Platinum and Palladium Performing So Well This Year? Why are Platinum and Palladium Performing So Well This Year? 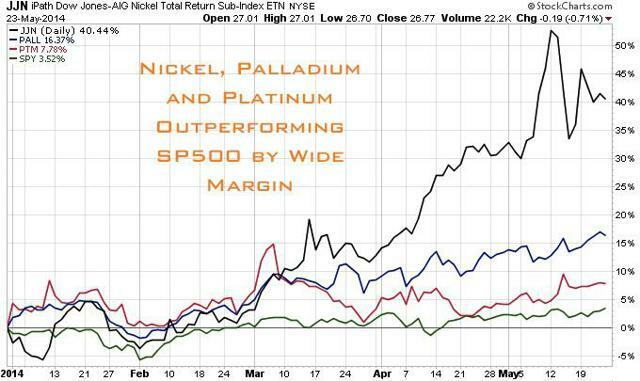 Platinum and palladium have been performing extremely well so far in 2014. In a recent article by Seeking Alpha, Jeb Handwerger discusses the top reasons he feels platinum and palladium are outperforming the S&P 500. Below we summarize his seven reasons for this trend. Keep in mind that South Africa and Russia control 80% of the platinum supply, and that supply is currently being threatened in both of those countries. They are also large producers of palladium. Questionable supply means higher demand, which leads to higher prices and value on the metals. American Bullion can help individuals purchase platinum and palladium for their IRAs. Precious metals potentially offer stored value for your retirement funds than paper assets, which are affected by inflation, monetary policy, and geopolitical tensions. Platinum and palladium, especially with their industrial uses, have intrinsic value no matter what is happening in the world. Call American Bullion today at 1-800-326-9598 to speak with a precious metals specialist.